The Trisha Brown Dance Company‘s performances at the Walker this week highlight their namesake’s dedication to the exploration of movement over that last 30 years. The music they move to reveals Brown’s engagement of unique compositional voices in this exploration. Their performances include music from experimental powerhouse Laurie Anderson and the master of chance John Cage. Alvin Curran will join the company at the Walker for a rare live accompaniment of Brown’s piece I’m going to toss my arms—if you catch them they’re yours. In the ’70s, Curran presented his music at the Walker on two occasions. His first visit was in 1977 with Musica Elettronica Viva, a group of electronic improvisors he founded with composers Richard Teitelbaum and Frederic Rzewski. He returned the following year to present a show of his solo work. The centerpiece of the evening was Light Flowers, Dark Flowers, billed as a structural improvisation featuring a tape recording, piano, “a section for ocarina, a monologue about the Trojan wars and a trip to the moon”. 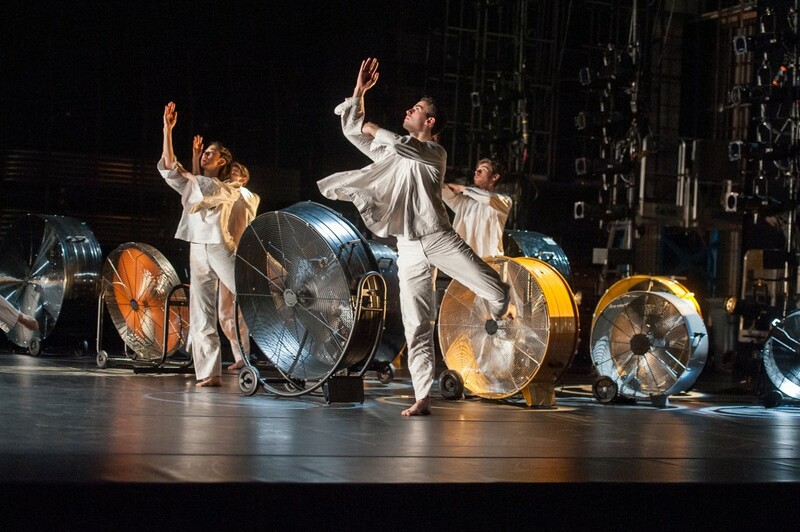 Curran’s music of synthesis lends itself well to experimental dance, and he composes frequently for movement. He believes that “sound and image together create an infinity of meanings, timbres, energies, and emotions that would be impossible to achieve using either alone,” making Brown an ideal collaborator. The two have been working together regularly since 1991, when she called Curran asking for some last-minute music for a piece of hers. In his work with dancers, he strives for a unity of the senses, what he calls “golden gestalts when one ecstatically hears movement and sees sound.” Brown’s natural yet investigative choreography serves this goal well, and Curran has the utmost respect for her and her art. “I’m sure like any angel she has some faults,” he writes. “I’ve just never seen them”. I’m going to toss my arms—if you catch them they’re yours, accompanied by Curran’s work, premiered in Paris in 2011, and the company has been performing it steadily ever since. The dancers’ movements are natural, comfortable, and rooted as they progress from isolation to contact throughout the piece. Their white costumes are slowly destroyed and blown away by the fans that share the stage, revealing brightly colored swim gear beneath. Curran’s accompanying piece, Toss and Find, is a reflective sonic backdrop for the movement on stage. Curran, on piano, joins a prerecorded tape with electronics and sounds of everyday life. Beginning well after the dancers have begun, the sound creeps in with drones and static that becomes increasingly shrill. The piano enters with sparse, pointed octaves. Eventually the elemental sound of a horn is heard, its open intervals recalling the creation of the world as told musically by Mahler or Bruckner. As the dancers’ bodies begin to interact and their papery clothes have been shed, children’s voices appear, and Curran introduces an entire scale, creating dissonances with the recording. His score of found sounds and simple motives is engaging alone, but it is made complete by its physical manifestation, the dancers’ movements translating with their bodies. “The human animal is eminently musical,” wrote Curran in a New York Times editorial. “Human music is a vehicle for personal and collective enjoyment and expression, and a means to transcend time and place.” The synthesis of his music with Brown’s choreography heightens this collective expression. As bodies move through and with his music, we may be moved to transcendence as well. Alvin Curran will perform with the Trisha Brown Dance Company in the McGuire Theater March 12 – 15 at 8pm. Copresented with Northrop at the University of Minnesota.